In order for this to run smoothly and to be a success, we need as many Club Members to assist us as possible. We can't do this on our own, and canceling isn't an option. ​There will be two shifts, a morning, and an afternoon shift. If you are able to help out, please leave your name and preferred shift in the comments. ​Come back soon to see details of our next event. 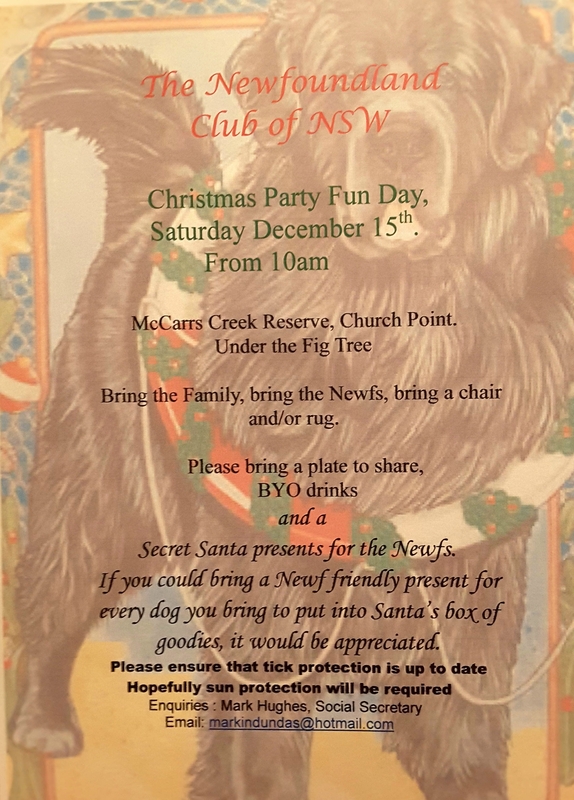 THE NEWFOUNDLAND CLUB of NSW Inc.
​Bring the Family, bring the Newfs, bring a chair and/or rug with you. a Secret Santa present for the Newfs. Please ensure that your dogs Tick Protection is up to date! Hopefully Sun Protection will be required. Best Marked Landseer, Sire and Offspring (minimum of 2) Dam and Offspring (minimum of 2). All remittances to be made payable to The Newfoundland Club of NSW Inc.
On behalf of the committee I would like to thank all those that attended and made the show and presentation a great success. As the judge said it was great to see such young dogs and her pleasure to award those examples of the breed as she did. Both dogs pictured are still babies with Cruz a puppy just under a year old and Ransom just turning one. 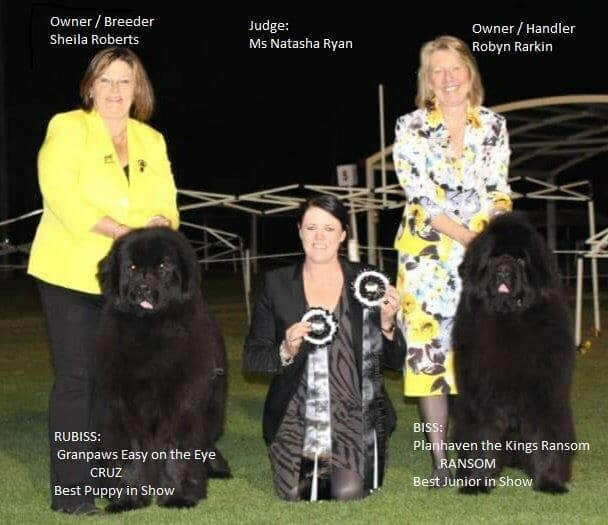 (Right) Robyn Parkin Co-Owner / Handler with BISS Planhaven the Kings Ransom 'Ransom' Breeder Ms Frances Wilson Planhaven kennels. WHAT: World record "Simon Says" competition for dogs and their owners fundraiser for National Breast Cancer Foundation. WHERE: Dog Arena, Castle Hill Showground Showground Road Castle Hill. DETAILS: Free to attend and parking is free. FREE SHOWBAGS for first 500 dogs to enter Simon Says. Children over ten permitted to play Simon Says - must be accompanied by an adult. All dogs must be on a lead. PHOTO OPPORTUNITIES: Dr Katrina and The Wonderdogs are available for photos. Dogs of various breeds can also be organised by request.